In a time where hotels with free breakfast are few and far between, we round up a list of six items you can get at hotels for free – if you ask. Whether you’ve forgotten an essential item, or are hoping to travel light and borrow from the hotel, you’ll want to come prepared with a list of items you can call the front desk for. Those sample-sized toiletries that we all know you stash and take home with you aren’t the only bathroom necessities your hotel can offer you. Forget the essentials for fresh breath? Most hotels will have mouthwash, toothpaste, floss, and shaving cream – among other small items – readily available for requests. Most hotels have travel-sized items of these at the ready, while hotels known to business travelers may also have other items like nail polish remover for the busy traveller on the go. Last year, Marriott Hotels announced a partnership with Netflix that select Marriott hotels would be able to sign-in to their accounts through an app on the hotel’s guest room televisions. While Netflix and other sites are always accessible through hotel WiFi on guests’ personal devices, this is the first time to add Netflix to guest room experiences at hotels for free. Now we just have to remember that we need to get some shut-eye on vacation, too. Forgot your cell phone charger at home, or find that your electronics don’t work with the plugs in Europe? Call the front desk and find out if you can get a loaner from the hotel for free. Oftentimes, people forget their chargers or plugins, hidden in outlets behind the bedside table, or under the desk, and hotels can end up with a collection of chargers fit for numerous phones, and adapters and converters perfect for North Americans in Europe needing to use electronics. 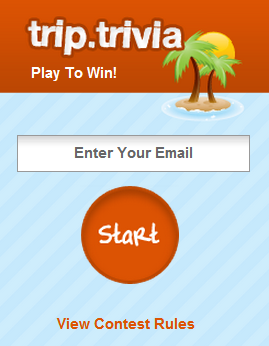 Want to wake up to your own music? Some hotels have iPod docks in the room, while others may have these available from the front desk, so your alarm and morning pump-up routine can go undisturbed while you’re on vacation. Hyatt’s Hyatt Has It program offers a wide “menu” of items available – both complimentary, and items to borrow or buy, including your hair items to get ready for your big date, business meeting, or night on the town. 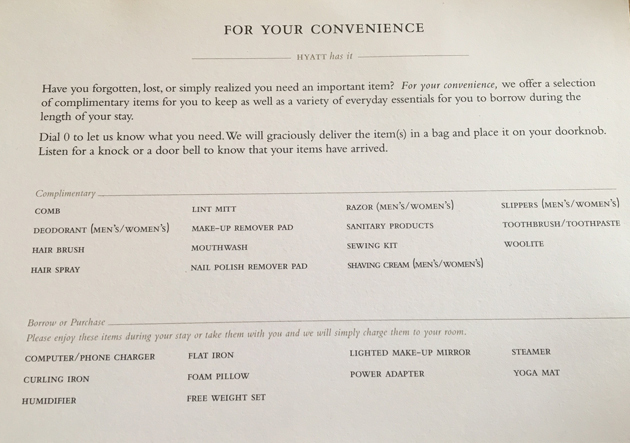 Other items Hyatt properties offer free of charge include computer and phone chargers, weight sets, flat irons, steamers, yoga mats, and humidifiers. The Hyatt program began in 2013 and aims to enhance the guest experience to ensure that every guest has the necessities and amenities that they require for a comfortable stay, at any Hyatt resort around the world. Enjoy a full pillow menu at W Hotels worldwide. As part of the W Privileges program, select your favourite type of pillow to sleep as if you’re home in your own bed: whether you need a body pillow, neck roll, something fluffier, or something flatter. These offerings to guests of the W Hotels are full of convenience-oriented amenities to ensure your trip is as comfortable as possible. 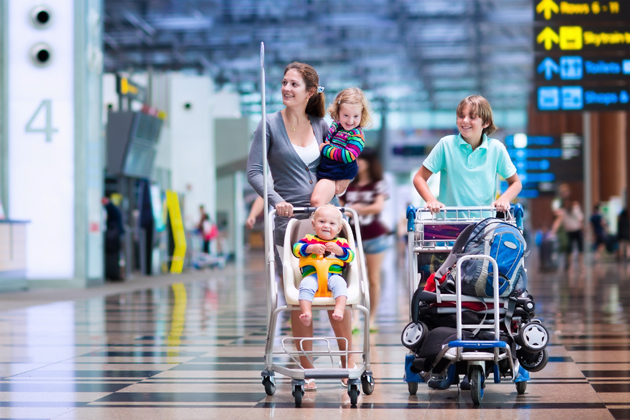 Many hotels offer items you’ll need for travelling with your children in hotels for free – from play pens to toys, to bassinets, at some resorts and hotels. Notify the hotel you’ll be visiting of your little ones and their age, and they might be made to feel special with colouring books or toys awaiting their arrival on the bed or at the front desk. Some resort chains, like Nickelodeons Hotels & Resorts offer even more for when you’re travelling with the youngest of adventurers: baby food, strollers, and baby bottle warmers come on their menu of handy amenities to help make your visit comfortable. What other items have you received for free while on vacation, or do you wish you could get from the front desk when you forget?